Dr. Dominique Monaghan grew up in Markham, Ontario, where her numerous childhood pets led her to dream of a career in veterinary medicine. She quickly fell in love with Guelph while completing her Bachelor of Science in Zoology in 2014 followed by her Doctor of Veterinary Medicine in 2018. Eager to continue to call Guelph home, she joined Campus Estates Animal Hospital in August 2018. Dominique enjoys working with all animals and is eager to gain experience in exotic animal medicine. She was a passion for wildlife and biodiversity, and has traveled to South Africa and Thailand with the Ontario Veterinary College’s Global Vets program to help local wildlife, as well as shelter animals in need. 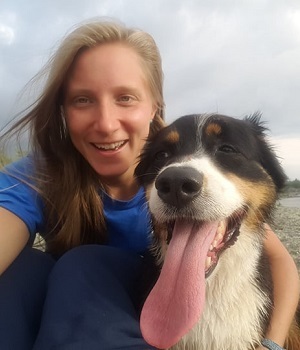 When she is out of the clinic, Dominique can often be found hiking in her second home of Collingwood, Ontario, with her handsome Australian Shepherd, Henley. She loves the outdoors and spending time in the mountains. Dominique also loves playing a great game of rugby! She looks forward to getting to know you and your pets!